Automatic tuning, technology that continuously monitors and automatically improves database performance in SQL Database, will be enabled by default in the upcoming period. Roll out of this change will be gradual and will start from January 15th, 2018. Two weeks before this change happens on any subscription, a notification email will be sent to subscription owners. All servers that do not have automatic tuning explicitly configured will inherit Azure defaults, making automatic tuning enabled. Similarly, all databases that do not have automatic tuning explicitly configured will inherit the configuration from the parent server. All newly created databases by default will inherit the configuration from the parent server. We have come to this decision as Automatic tuning has reached a point in time where it has been proven that the solution provides a clear value gain to customers in terms of stable and performant workloads, it saves resource utilization resulting in customer costs savings, while at the same time designed not to impact the current operations and workloads. Automatic tuning has reached the point where it is ready to be enabled by default for SQL Database. Since automatic tuning reached global availability in early 2016, the SQL Database team continued investing in improving its capabilities. Learning from a massive pool of customers who already adopted automatic tuning, we have made advancements in recommendation models, increased the speed and safety of applying tuning actions, and removed obstacles to enable a path for even most demanding customers with massive workloads to adapt the automatic tuning. Click here to read about great benefits that SQL Database customers achieved using automatic tuning. All resources that do not have automatic tuning configured after January 15th, 2018, will be included in transition schedule from unconfigured to having servers configured to inherit from Azure defaults, and databases configured to inherit from parent server. Prior to transition, if automatic tuning is configured on any resource, such resource will not be included in the automatic transition. Click here to read more about how to configure automatic tuning. Tuning operations applied to Azure SQL Databases are fully safe for the performance of your most intense workloads. Automated tuning recommendations are applied only at the times of a low utilization. The system can also temporarily disable automatic tuning operations to protect the workload performance. In such case, “Disabled by the system” message will be shown in Azure portal. Automated tuning operations applied are verified automatically to ensure there is a positive improvement to the workload performance. Regressed performance recommendations are dynamically detected and promptly reverted. Through the tuning history log there is a clear trace of tuning improvements made to each Azure SQL Database. Automatic tuning is fully configurable - it can be configured on the server and database level. Servers can be configured to inherit the automatic tuning configuration from Azure defaults, or not to inherit the default configuration. Databases, beside these two options, can be also configured to inherit settings from the parent server. In addition to configuring resource level configuration, on both server and database each automatic tuning option can be explicitly enabled or disabled separately. 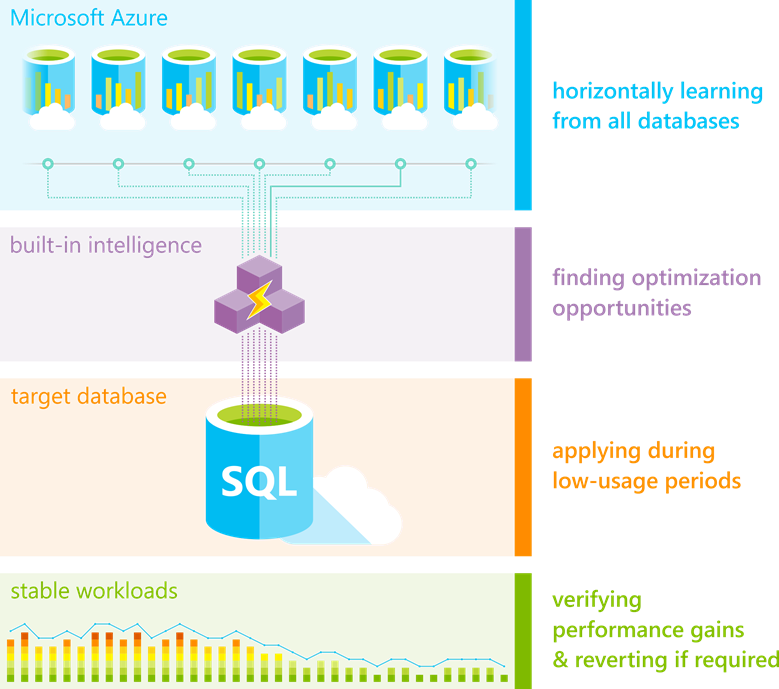 Click here to read more about automatic tuning in Azure SQL Database. In case you would like to start using automatic tuning earlier, create a custom automatic tuning configuration, or disable automatic tuning on your resources, please configure the automatic tuning on your resources before January 15th, 2018.